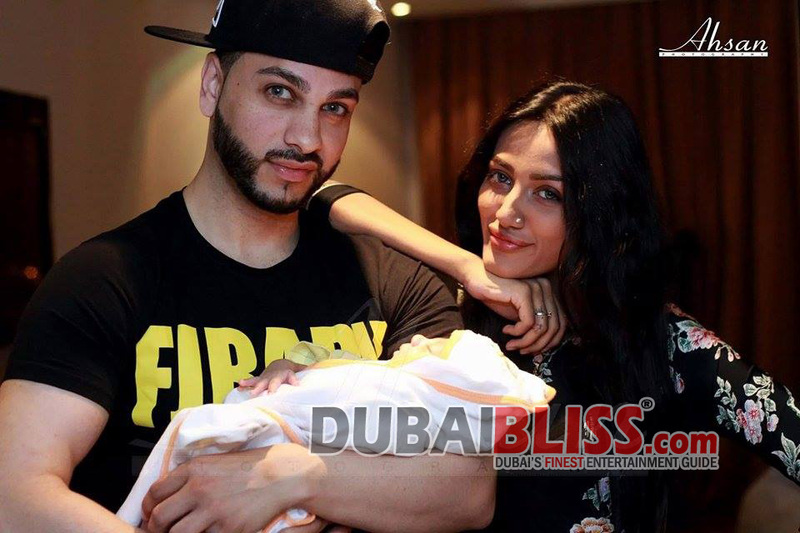 Home Paparazzi Mathira, Flint J shares unseen pics of their baby. When Kanye West and Kim Kardashian released first pictures of baby North West, the whole World went crazy.. And we’re going to repeat that scenario again! Dubaibliss.com bring you never before seen pictures of Mathira’s family; one of the most talked about couple in Pakistan’s entertainment industry. Ok! Still confused?? We’ll break it down for you..
Mathira, whos a model, actress, tv host and famous for her Item songs in ‘Main Hoon Shahid Afridi’ got married to Flint J, whos a rapper, singer and a producer based in Dubai. She has been married for a year but chose to keep news of her marriage away from the media spotlight, until the FJBABY, that’s what his father likes to call his son. Recently, Mathira tweeted about becoming a mother and confessed her husband’s name as; Flint J. The couple is in Karachi these days spending time with their new born baby boy. And why not?? He’s so cute, Flint J says ‘His first breath took ours away’. Previous articleAtif Aslam fans shout GO NAWAZ GO!